PMP ITTO: Remembering the PMBOK Inputs, Tools and Techniques, and Outputs (ITTOs) is probably the most dreaded part of PMP Certification Exam preparation. Whether one needs to memorize the ITTOs or understand is always open to debate. Regardless of the right approach, we all know that PMP exam does have 7-10 questions related to ITTOs. Therefore, it’s advisable to do some practice on ITTO related questions for the exam. Update: Worried about ITTOs for the PMP exam? I have got some good news for PMP aspirants. I came across a new free tool called ITTO Quiz that helps you practice ITTOs related questions online. 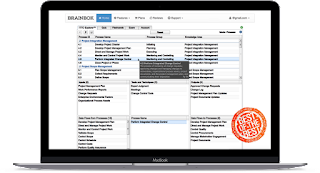 The tool has been developed by Primoz Frelih, PMP. I did a quick review of the tool. WOW! I just realized this is my 100th post on this blog. Time to celebrate !! No sign-up is required. Simply visit the site anytime and practice. Addresses a very important need of PMP aspirants. Good for final revision before the exam. The format of questions is fixed. It presents the ITTO list and asks the user to select whether its an input, tool and technique or an output, and then pick the process it belongs to. In continuation to the previous point, I would like to see the questions in the format of real PMP exam questions. Give a question and present four answer choices. The processes are presented in a drop-down list and one may need to scroll through the list to pick the right answer. It would be better to layout all the 42 processes neatly on the main screen, specially when there's so much of real estate available. The answers are presented in annoying pop-up windows. And even worse, it throws two pop-ups for each answer. The quiz duration is too short. Just 3 minutes. It would be great to have an option to register and login, in order to keep track of scores. This is more of a wishlist item. It would also be nice to get some kind of summary report at the end. This is also part of my wishlist. Overall, I feel that it’s a great idea and a very useful service for PMP aspirants. However, the quiz format and the user interface needs some improvement. So, what are you waiting for? Head over to PMP Exam ITTO Trainer (BrainBOK) and ace the PMP exam. Don’t forget to drop a note of thanks on that site. Disclaimer: I have absolutely no affiliation with PMP Exam ITTO Trainer. Thank you for sharing... its a wonderful tool and I also agree with your comments for improvements... especially the point where you mention that it should have been in the exam format. Hello, thanks for the review! This kind of practice helped me to master the ITTO's for the PMP exam in just few days. This version of PMP questions will be valid for another 3 years and I hope to release an upgrade to the current "PMP exam ITTO Trainer" in the meantime. And take some of your suggestions into account! This is a great tool for last minute preparation and to help create the 9X5 42 processes braindump, prior to the exam. After practicing for about an hour I was able to answer 12- 15 questions during the 3 minutes , sometimes more. What I didn't like about it is that questions will repeat within the same 3 minutes timeframe. Another area that needs improvement when not knowing what the answer is . For example Expert Judgment, this tool can be found in Develop project management plan as well as Develop Project Charter processes, at this point you have to guess to determine what the right answer is. Thanks Pamela, and I'm glad you found it useful. Worried about the ITTOs for the PMP exam? There's no looking back from here.